Answering a question depends on the point of view we would like to choose. For a long time the society has been rewarded for living unreflectively – for living an unexamined, inauthentic and superficial life. The ideal of a person as promoted in the media was self-centered, materialistic, anti-intellectual and often driven by sensuality or greed. Today we witness how beneath the distorted value system, the eternal human qualities are being remembered, strengthened, and given the freedom to evolve. We are regaining the power of human relationships, discovering the harmony with our physical environment, colleagues, friends, family, our inner-self and our spirituality. The knowledge of the realms of mind and body has been wrongly separated for centuries. We were created with a capacity to experience pain, with a certain level of discomfort or “healthy” anxiety. This is our continuing fear of moving through life towards death. Our symptoms have important meaning. The pain is a response to a situation or person that unsettles us. The feeling of being depressed or anxious provides us with a chance to reflect upon ourselves and to change the behavior that brought these emotions to us. If we choose to mask these feelings with medications, we evade the search for the reason behind our unsettledness. We avoid taking responsibility for our relationship with our selves and life. However, the designer of the Universe felt that our pain is instructive. It is our gift if we accept it as a loving part of who we are. It is the most invaluable lesson that lies deep inside of each of us. Everyone discovers the message in his own time, the message of how fragile life is and how brief is our time. Meditation is a system of practices, that helps people take responsibility for the quality of their thoughts. Meditation practices can help you enter the center of your stillness and serenity, to reach a “zero point”. From this point, you can observe apart the flow of your changing emotions, thoughts and intentions and gradually understand their origin and meaning. 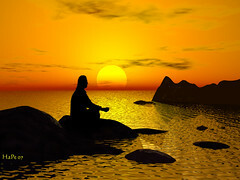 In the past, meditation was viewed as spiritual or religious practice. Today more and more people turn to meditation to receive the benefits of deep relaxation, and to handle successfully the psychological and psychosomatic challenges, releasing the accumulated stress in the body. Some psychotherapists believe that meditation and hypnosis are similar states of mind and that the first one is just a part of the second. Electroencephalography or EEG shows that meditation is a more structured state of the consciousness. Hypnosis has different indicators. If it is a quite hypnotic sleep, we will see decreasing or complete disappearance of alpha rhythmic brain activity, reducing the frequency and amplitude of beta rhythm and appearance of delta like slow waves. The recording of the brain’s electrical activity during hypnosis can be like the normal activity when you are awake. The person who is meditating is in a state of a focused concentration and the electrical activity in his brain is as he is ready to fall asleep. These facts are leading us with great curiosity and increasing attention to study the teachings of Yogis. During meditation, they report that their whole body is in a state of deep sleep, and their mind is in a state of a special type of wake. The word “meditation” is from the Latin – meditatio,” is moving to the center”. There is also a version that meditatio comes from meditor– “to think, to contemplate, device, ponder”. Exactly this is what happens during meditation. Without strain, without applying any kind of effort, you are appearing in the center of yourself. You are experiencing the feeling of being on a high elevation and observing from it everything that is happening. You can see clearly and distinctly what is important to you and undoubtedly realize it. From this elevated point, you can find out a lot about the person you thought you are or were. You will begin to understand this person’s life scenario, the plot of his destiny. Did his parents reject him? If this happened, did he allow this situation to influence his life? On the other hand, maybe the mother loved more his older sibling. If that was so, does the youngest continue to compete in order to be the first in the eyes of his mother? Does this person live in fear that life is passing him by? … All this begins to seem to you like a script written for someone else. You notice how old emotional “wounds” start t to heal. Now let us go back to the pharmacology. In the past, the business interests of managed care and the paradigm of biological psychiatry have challenged our society. Today the facts speak for themselves. The power of human mind and consciousness over the human body is not any longer denied. It is common knowledge that the only reason medicines work is because they mimic the natural processes of the body, after the mind gives its permission and faith. How would you answer the question now, from the perspective of knowing that your body has all the recourses to heal and overcome any discomfort? What would you do, knowing that the depression you experience is a gift to show you that you are missing something in your relationships? Your relationship with the physical world, your relationship with others, and your relationship with yourself, with the spiritual world – do you feel any unsettledness there? If yes, smile, because you are alive and given the courage to see a possibility of a greater fulfillment of Life.